Here's a little taste of home-baked goodness from my dear friend, Nancy. They're quick and simple, so you can whip up a fresh batch and have them out of the oven in no time. They're light and flaky and cozy and comforting and delicious and yummy and perfect! 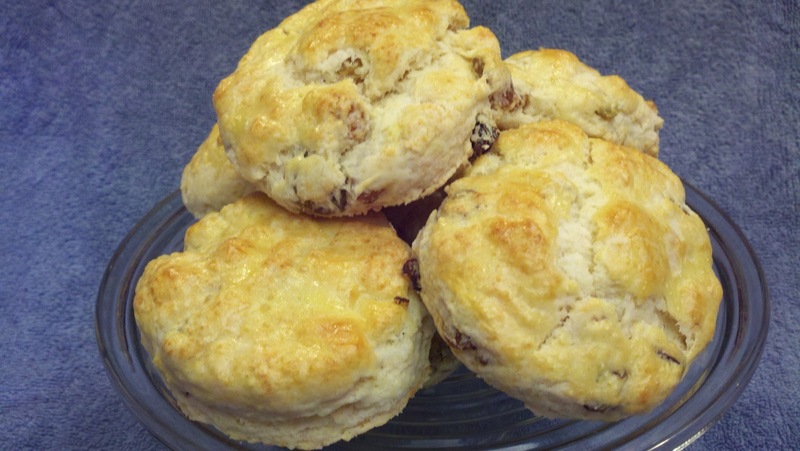 Serve them warm, just out of the oven, with a little spoonful of Fresh Orange Marmalade or Strawberry Jam. They're just the thing for a Sunday brunch or a midweek afternoon tea. Love 'em! Thanx Nance! Just remembered you had asked for my tea biscuit recipe a while back and I don't think I every sent it over to you. Hope you like these as much as we do. I make them almost every week now. Tom and the boys love them! I found three different recipes online and took parts from each that I liked. It turned out to be my own recipe. I cut way back on the salt suggested. I added just a little sugar. One recipe said no sugar and another recipe said half a cup. I decided on 1 tablespoon and it is just the right sweetness, especially since I added the raisins and the recipes I looked at did not have raisins in them. The thing I like best about them is that they turn out very flaky and light. Sometimes biscuits are too heavy, but you can eat two of these and you don't feel like you over did it. I also use fat free milk to save some calories. Let me know what you think when you try them. Preheat over to 400 degrees. Grease a baking sheet. Combine flour, baking powder, salt, and sugar. Cut butter in until mixture has a fine crumb texture. Stir in milk with a fork to make a soft dough. Drain the raisins from the water and add raisins into dough. Knead 8 to 10 times, and then roll out to a thickness of ½ inch. Cut into rounds with a cookie or biscuit cutter (I used a small juice glass). Place on cookie sheet, and allow to rest for a few minutes. Brush tops with egg wash. Bake for 12 to 15 minutes (until light golden brown on top). Serve warm. To cut the butter into the dry ingredients, I just threw everything into a food processor and pulsed it a few times until it resembled coarse crumbs. Super fast! Instead of greasing the baking sheet, just line it with parchment paper, or use a silpat (nonstick mat). If you like a sweeter biscuit, go ahead and add another tbs of sugar, but they seriously don't need it, especially if you're serving them with jam. For a little variation, try using Craisins (dried cranberries) or other dried fruit instead of the raisins. For a little hint of sunshine, you could even add a little grated orange or lemon zest to the dough before you roll them out. Delish!